Slow Cooker Hearty Chicken Soup. Sharing a cozy, warming recipe today, Slow Cooker Hearty Chicken Soup. Say hello to the warmest, coziest most perfect home cooked bowl of chicken soup. 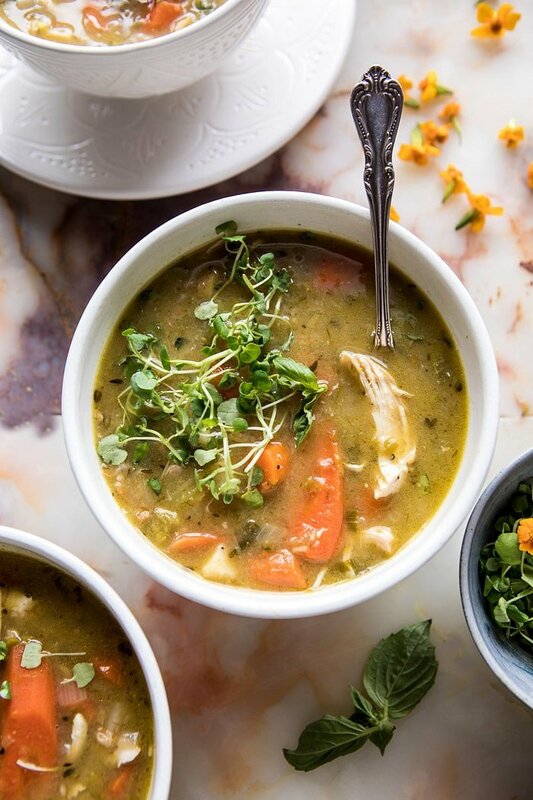 It’s full of colorful veggies, good for us protein, and is sure to take care of just about any cold that winter throws your way. If you couldn’t tell, I am so exited about today’s recipe, and not just because it’s delicious, but also because it comes from a really cool cookbook, the Share Cookbook. If you guys remember, I’ve been teaming up with my friends over at The Little Market a lot this year (did you see my Valentine’s Day post?). The Little Market is one of my favorite nonprofit brands that’s helping to empower women. They carry home goods from female artisans around the world. They recently added a few new cookbooks to their list of gorgeous products and I cannot wait to tell you guys about them and help to spread the word. The coolest talking point about these cookbooks is the fact that each cookbook helps to support a different cause. 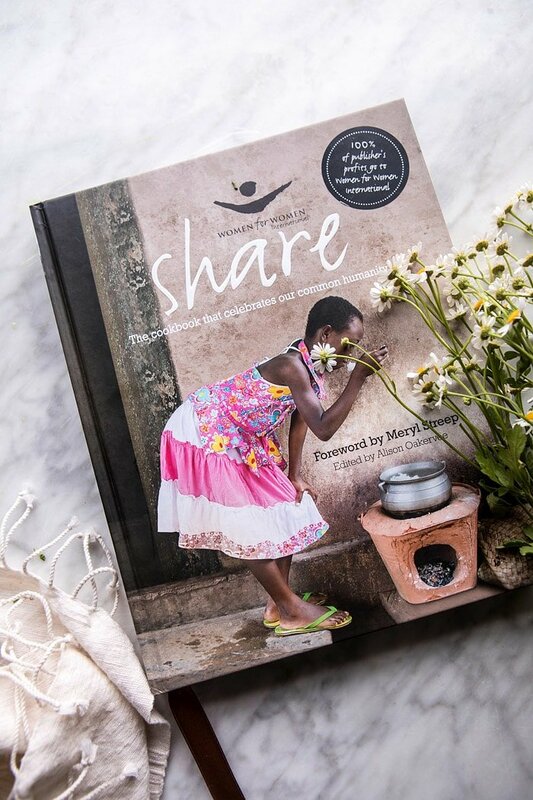 The Share Cookbook supports Women for Women International, The Immigrant Cookbook supports the ACLU Immigrants’ Rights Project, and the Soup for Syria Cookbook helps fund food relief efforts through the United Nations Refugee Agency UNHCR. Pretty amazing, right? Aside from the incredible causes these cookbooks help to support, they are also incredible in the fact that each book is filled to the brim with delicious recipes. It’s safe to say that I had a very hard time picking just one recipe to share with you guys. I went back and forth for days about what to make because so many of the recipes sounded so delicious, but in the end, the cold snowy weather got the best of me, and I went with a cozy bowl of chicken soup from the Share Cookbook. All I have to say is that is was a really good decision. This soup is beyond good. What caught my eye about this particular soup recipe was its use of vegetables and herbs. 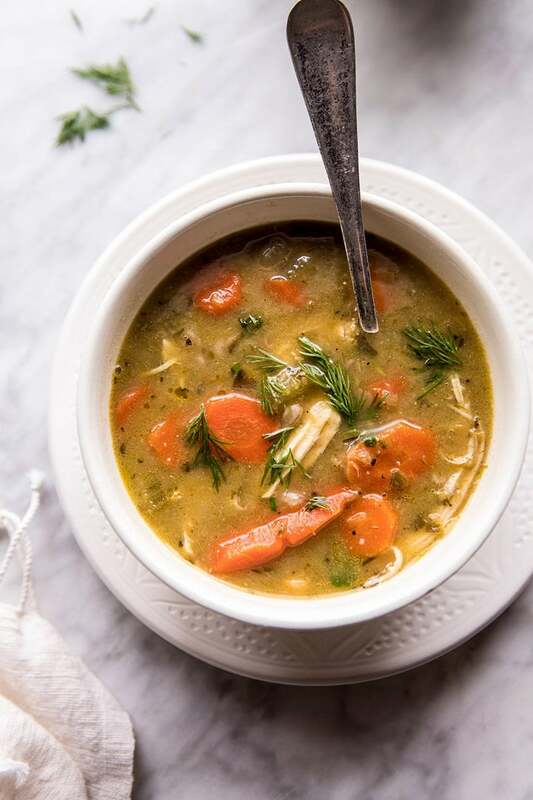 Unlike a lot of chicken soup recipes, this one is packed full of veggies, like onions, carrots, and parsnips, and it uses a wide mix of herbs that make the soup extra flavorful. The original recipe is made for the stovetop, but I ended up adapting it for the slow cooker to make things a little simpler. Plus, I just love the idea of chicken soup slow cooking all day long. I mean, the smell alone is worth making this. 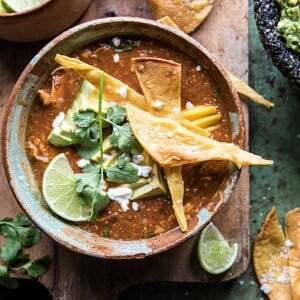 Like most slow cooker recipes, you add all the ingredients to your slow cooker, forget about it, and come home to the best home cooked soup. Add farro and you’re done. So easy, super healthy, and even more delicious. The only way to make this soup better is with a side of crusty bread, which I highly recommend doing. I ended up letting this slow cook all day on Sunday while filming new HBH cooking videos with my brother Malachi, who films and edits all of HBH’s videos that you see on the site. Kai has a bad cold and said the only thing that sounded good was chicken soup. So, I threw this into the slow cooker and by the time we finished filming for the day, the soup was ready. 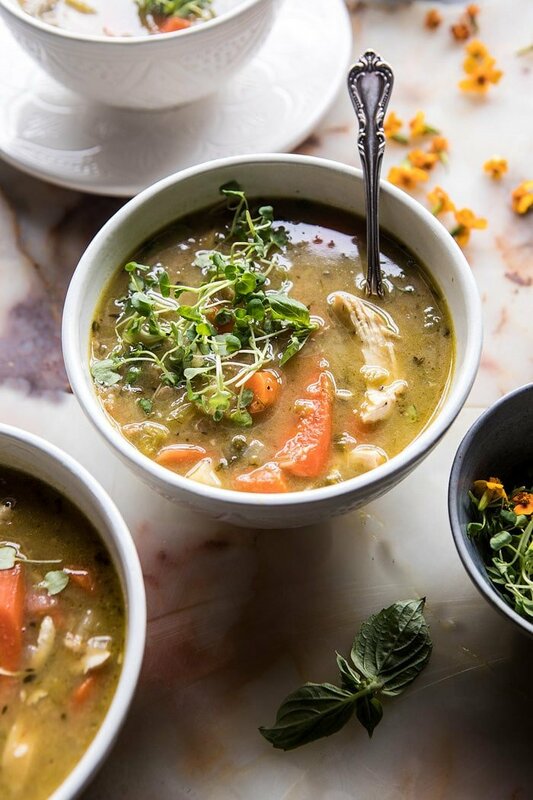 I served up a couple bowls and we both agreed that it’s truly the perfect chicken soup, we especially loved the fresh topping of cilantro at the end. I had leftovers, so I packed them up and saved them for lunch the next day and I swear the soup got better as it sat. One tip if you do end up having leftovers, or plan to make this for meal prep, I recommend either removing the farro (you could also use pasta) from the soup before storing or just cooking the noodles separately and adding them to your bowl before serving. The hot broth will be enough to rewarm the farro. If you leave the farro in the soup, the farro will soak up a good amount of the broth. Also? It’s not in these pictures, but I ended up topping my bowls of soup with stove popped popcorn. I know it sounds odd, but this is something my mom has always done with soup and it’s honestly the best soup topper ever. The original recipe is made for the stovetop, but I ended up adapting it for the slow cooker to make things a little simpler. Plus, I just love the idea of chicken soup slow cooking all day long. I mean, the smell alone is worth making this! 1. 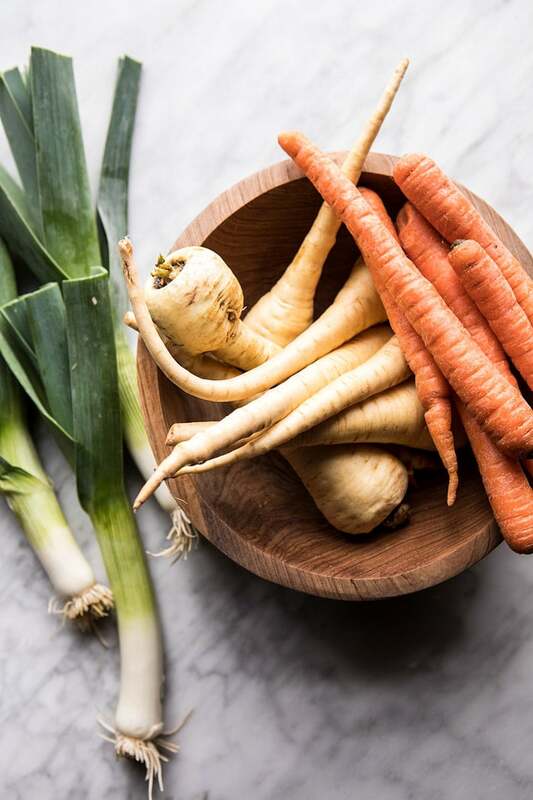 In the bowl of your crockpot, combine the chicken stock, butter, olive oil, onions, carrots, parsnips, celery, leeks, peppercorns, bay leaf, thyme, rosemary, and a pinch each of salt and pepper. Add the chicken. Cover and cook on low for 5-6 hours or high for 4-5 hours. 2. About 45 minutes before serving, remove the chicken from the soup. Remove the herbs and discard. Stir in the lemon juice and zest, plus the farro. Shred the chicken and stir it back into the soup and cook until the farro is tender. 3. Divide the soup among bowls and top with herbs. Serve with a hunk of bread. Heat the butter and olive oil in a large pot over medium heat. Add the onions and cook until softened, about 8 minutes. Add the carrots, parsnips, celery, leeks, peppercorns, bay leaf, thyme, rosemary, chicken stock, and chicken. Cover and bring to a boil, then reduce the heat to low and simmer uncovered for 2 hours. Shred the chicken. Stir in the lemon juice and zest, add the Farro and cook 25-30 minutes. Serve as directed. Follow the slow cooker directions. Cover and cook on high pressure for 15 minutes and then use the quick release to release the steam. Shred the chicken, add the lemon and farro and cook on sauté until the farro are soft, about 15 minutes. Serve as directed. Soup and a cozy Tuesday night. Yes. Hi Titi! Yes, everyone came back safe! Thank you! It looks amazing! One question , do I use boneless,skinless chicken? Veggies! Prepping this today for tomorrow’s Crock Pot dinner!! I’m giving this 5 stars upfront because there’s no way this could be less than awesome! Thank you so much Lisa! I am so happy you enjoyed this! This looks amazing, T! 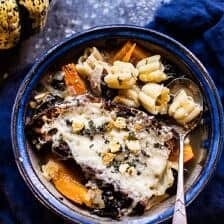 I really love having cozy soups like this during the late weeks of Winter when Spring is taking forevvvvvvvvvver to come. Thanks for sharing! This soup looks so wonderful. Perfect for a cool day. Do you use bone IN chicken? or boneless? This looks delicious! Is the butter absolutely necessary? I’m lactose intolerant. Could I use Ghee or just more olive oil? Great recipe. Farro is difficult to find in my part of the world, could I use quinoa instead? I love your recipes. I’ve made several of them. And I was absolutely thrilled to watch Red win the Gold Medal! I was extra happy for many days after that. I do want to tell you that for some reason, for the last two weeks, your website will freeze and then go blank and then reload. A message appears that says “This webpage was reloaded because a problem occurred.” I use an iPad, the Safari browser, or an RSS reader for your website. The error has occurred on both. Yours is the only website doing this. So I’m passing this along to you in the hope that you can pass it along to your IT people. Thanks so much for all your inspiration! Hi Jennifer! I am so glad you are enjoying my recipes and were able to watch Red! Thank you so much for letting me know, I will try to resolve this problem! 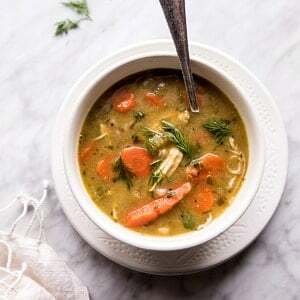 Okay, so I had a bad experience with parsnips, totally weird I know, and I haven’t really gone back to them, but this chicken soup looks too good to pass up, especially with it being hearty! I hope you love this Aimee! Thank you! I love this soup and the pictures (I like the white background and clean look). Also, I really love the cookbook and it’s cause. That seems like a lovely Easter or early Mother’s Day gift. Maybe I can make this soup for my mom when I visit next week. 🙂 I’m sorry Kai has a cold. Hopefully the soup helped! Sleep well and stay warm. I love all the veggies and the farro in this Tieghan. Thanks so much for sharing this recipe and the cookbook here at HBH. I’ll need to check it out. Love the idea of the popcorn as a topping for the soup too! Thank you so much Mary Ann! I am so glad you’re liking this! It’s still winter here, so this would hit the spot! That soup would make anyone feel cozy. Wish I had a big bowl right now! Yes! So perfect for you, Jennifer! This looks so comforting and flavorful! I love it! A cozy, warming bowl of soup sounds like heaven right now! Love this! Would love a bowl of this right now! 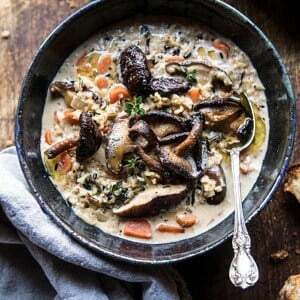 If you wanted to make this soup gluten free which ingredient would you use instead of farro? Quick question. In the instructions, under stove-top and instant pot you mention adding the noodles. Would I cook for the same amount of time if I were using the farro? I’m mainly talking for the Instant Pot. Thanks! 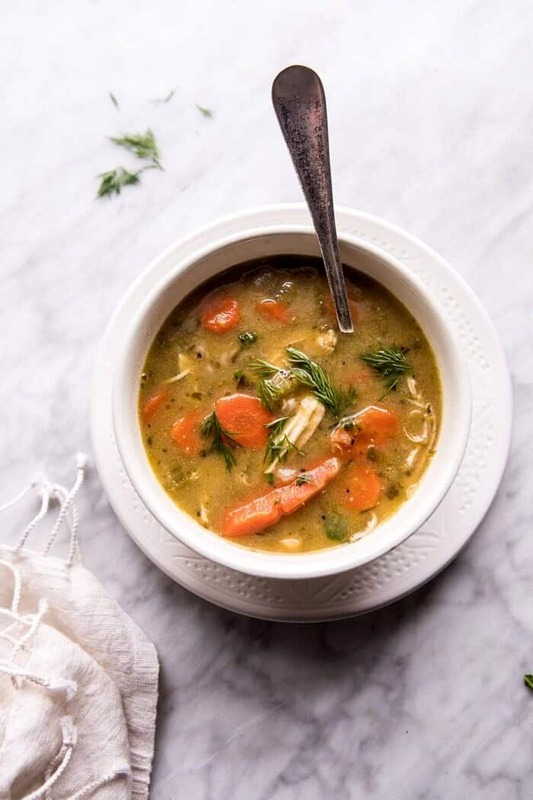 This is on my menu for next week because winter seems to be lingering a bit longer than expected in KY.
What a good soup! My toddlers inhaled it and asked for seconds. 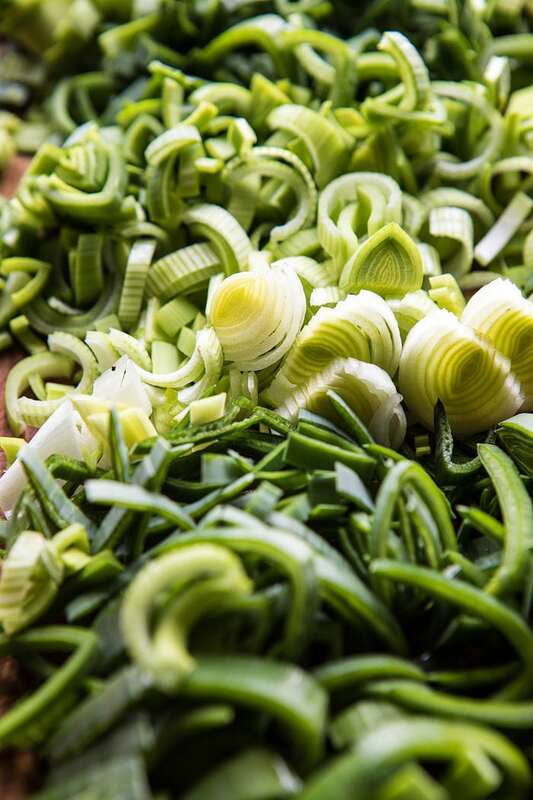 I had never cooked with farro or leeks before, so thanks for expanding my horizons. I am really glad you enjoyed this Liz! Thank you! LOVE that these cookbooks support different causes! So cool! This soup looks so warm and cozy! Perfect dinner on a cold night!! Are we supposed to add tarragon? How much tarragon do I use? I do not see it in the ingredients section. Hope to hear from you soon! This was wonderful!!! We did it with a mix of thighs and breasts and thought it was perfect. The lemon ans rosemary really make it. Thank you! Hi! This looks delicious as all your recipes do! If I omit the butter and do only 2 T of olive oil total, do you think it will affect the flavor that much? I really like your soup recipes. I made this tonight for my family on the stove top. It was easy to follow and prepare. I used half a lemon and pasta as I didn’t have farro. It is delicious and I will definitely make it again. Thank you so much Paulette! I am so glad you enjoyed this recipe! Did you start with raw chicken? What do you think of using corn instead of farro (I don’t have it)? This recipe looks delicious! If using egg noodles or brown rice, would they go in same time farro would? do you think this would freeze well? I haven’t frozen cooked farro before! thanks! Is it the 868 calories for the entire pot? or for a single bowl?? What size crock pot did you use to make this? Recipe looks absolutely incredible. Have all the ingredients (although boneless skinless thighs) and can’t wait to make this on the stove later. The perfect soup for a foggy gloomy PNW night! Thank you Patty! I hope you love this soup! This looks SO good! Can you use frozen chicken breasts in the Instant Pot? AIMEE: I, too, had a bad experience with parsnips, also. I cannot even stand to smell them LoL… I served them at Thanksgiving one year (never tasting them before). I roasted them in the oven and they looked devine…. however just their smell, alone, was a turn-off for not only me, but our entire family. Those that even took some, after one taste, left the rest on their plate. Had to trash the rest. I felt terrible. I will never serve something I have not tried myself to family. Tieghan, this soup looks so good. 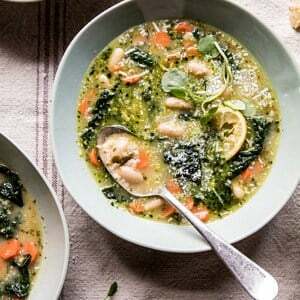 I amnot much of a “chicken soup” fan (too much Campbells CS as a child I guess), but this homemade version looks very yummy– minus the parsnips. Even the addition of a little fresh corn or noodles might be good. I love your website and recipes!!!! I tell all my friends and family about it!! Thank you so much! I hope you love this recipe if you get a chance to try it! Thank you so much! Loved this easy, yummy soup! Perfect for a Michigan winter too…and a Monday night! Thank you for always Sharing your delicious meals! Love your blog, photos and recipes! I am so glad this turned out so amazing for you, Ann! Thank you! Fab recipe. I am currently making this for my weeks worth of lunch time soup for work. Should I freeze 2 days worth or would it be ok in the fridge until Thursday? Thanks. Great soup. Loved by all who tried it. Even wanting some to take extra home with them. It feels so good to eat – I’m sure our bodies were thanking us for taking such good care of them. I’m about to make it again. Delicious. I am so glad you all loved this Karen! Thank you so much for trying it! Just made this for my sick boyfriend, we both loved it! Thanks for the great recipe! This soup looks delicious!!! How can I make it gluten-free? Plan to make this this weekend for a sick friend. I’d like to sub in egg noodles. Do you think that would be okay and about how many noodles would you use? 16 oz? I am not a herby person and I also didn’t have he herbs mentioned, so instead I went for more of an Indian flavour with some cumin and curry. Soooo good. Like you said, this soup was better on day two, or three. I made it on Sunday, and ate some again today (TuesdayY. Delicious! Thicker and richer broth. So yummy. Thank you! I love your recipes. So easy and delicious! I added pasta instead of Farro (because I couldn’t find it in stores here (Australia)), and I halved the recipe and still got 3 servings. Maybe because of the pasta, it wasn’t as soupy as I was expecting, but it’s still really good. 10/10 will make again.